The art of Dowsing is ancient with Hieroglyphics being found in pyramids of figures using dowsing rods. During the Middle Ages in countries such as England, France and Germany, dowsing was a widely used modality. The Bible tells of Moses finding water in the desert using a staff. Wall murals, estimated to be about 8,000 years old, discovered in the Tassili Caves of North Africa depict tribesmen surrounding a man with a forked stick, possibly dowsing for water. Artwork from ancient China and Egypt show people using forked tools in what might have been dowsing activities. Albert Einstein was convinced of the authenticity of dowsing. 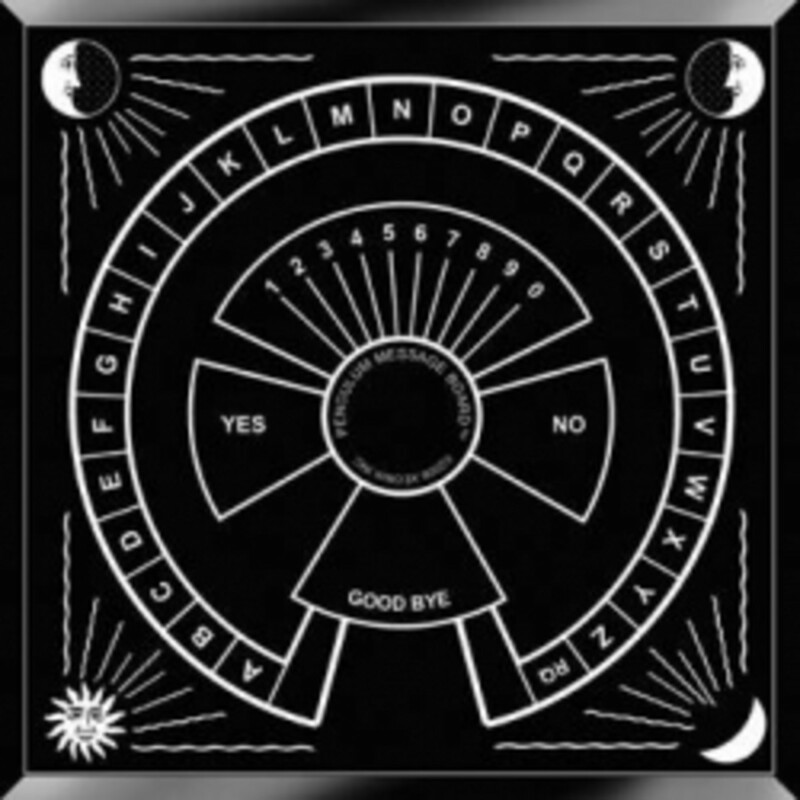 He stated, "I know very well that many scientists consider dowsing as they do astrology, as a type of ancient superstition. According to my conviction this is, however, unjustified. The dowsing rod is a simple instrument which shows the reaction of the human nervous system to certain factors which are unknown to us at this time." Dowsing is a natural, simple gift from the Universe and can be done using a rod, stick or pendulum in order to glean insight and answers to our deepest questions, to locate underground water, buried metals, send vibrational healing to humans, animals and the Earth itself and to clear negative energy fields and ley lines in our homes and environment. All things, living and inanimate, possess an energy force. The dowser, By concentrating on the hidden object, the dowser is able to tune in to the energy force or vibration of an object which, in turn, forces the dowsing rod or stick to move. The dowsing tool may act as a kind of amplifier or antenna for tuning into the energy. The most traditional method uses a small Y-shaped tree branch (most often from a Willow). The dowser holds the branch parallel to the ground by the top of the Y shape, then walks over the area to be probed. When the dowser passes over the sought object, the end of the branch is drawn down, pointing to the spot at which the object can be found. An alternate method uses two L-shaped metal rods, one held in each hand parallel to the ground and parallel to each other. In this case, when the dowser passes over the sought object, the rods either swing apart or cross each other. 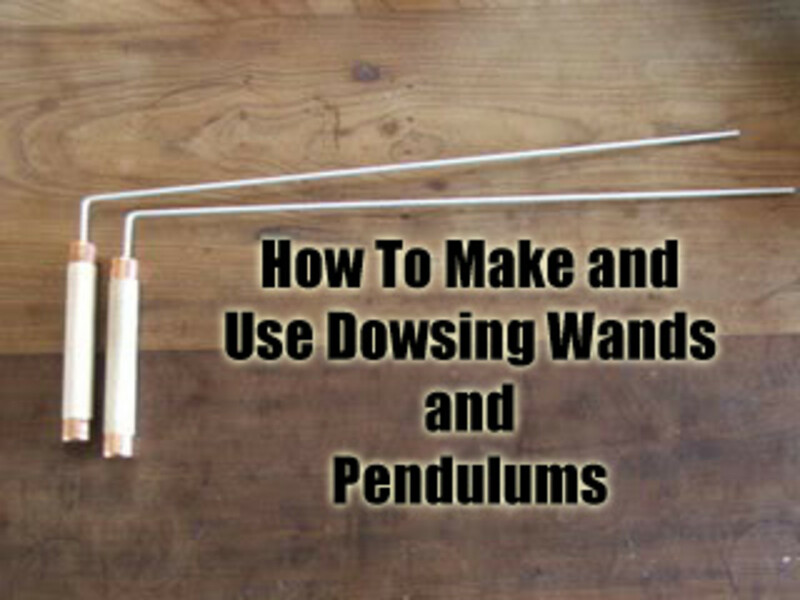 You can easily make dowsing rods from wire coat hangers. Some dowsers don't even have to visit the location to be dowsed. For them, a map of the area is sufficient over which they hold pendulum. They know they have located the target area when the pendulum begins to move in a circle or back and forth. Pendulums work by connecting with electrical impulses created by our subconscious minds. These influences cause the Pendulum to move, and we can then read these movements to gain insight into the deepest parts of ourselves. The pendulum is basically an amplifier and is a tool that helps you to access the collective unconscious and your Higher Self. Everyone is capable of working with a pendulum. Learning to work with it is like learning to play an instrument. It requires constant practice and experimentation. Making mistakes is part of the learning process. The results you get will reflect your stage of spiritual/mental development. Swinging the pendulum requires that you be undivided and totally present in the moment. Just has humans suffer from dis-ease cause by various stresses, so too does our Mother Earth. The Earth has it’s own energy fields and ley lines. Some of these fields and lines are negative. This is called geopathic stress. This is often caused by ley or Earth lines, pressure faults (which emit radiation) and underground streams. In today’s world we deal with the problems of old as well as new ones such as electromagnetic stress and microwave emissions from mobile phones and other devices such as computers, power points and many other man-made electrical devices, are linked to many illnesses and dis-ease. We are able to surmount these new challenges and bring ourselves into a positive, peaceful, harmonious and ‘light’ state. We are able to do this by using the power of our minds, our determination to overcome any threats to our well-being and our intention to enjoy a happy and healthy existence. To clear or rid a home of any energetic disturbances, dowsing is a very valuable tool. Dowsing brings harmony to our environment by giving us the ability to discover where the disturbances occur. By Dowsing you are able to clear and refresh your entire home, bringing a lightness to the atmosphere and a feeling of renewal, safety and comfort. Everything consists of energy. Each and every thought, deed, action and experience we have produces a vibration or energy pattern. Experiences that we have throughout our lives affect us. Dowsing can be utilized to assist us to heal and enhance our health and wellbeing. As humans, we consist of energy and are also surrounded by an energy field called the Aura. Our Aura sometimes has blockages or disturbances caused by many negative influences during our lives and when this happens we are out of balance. 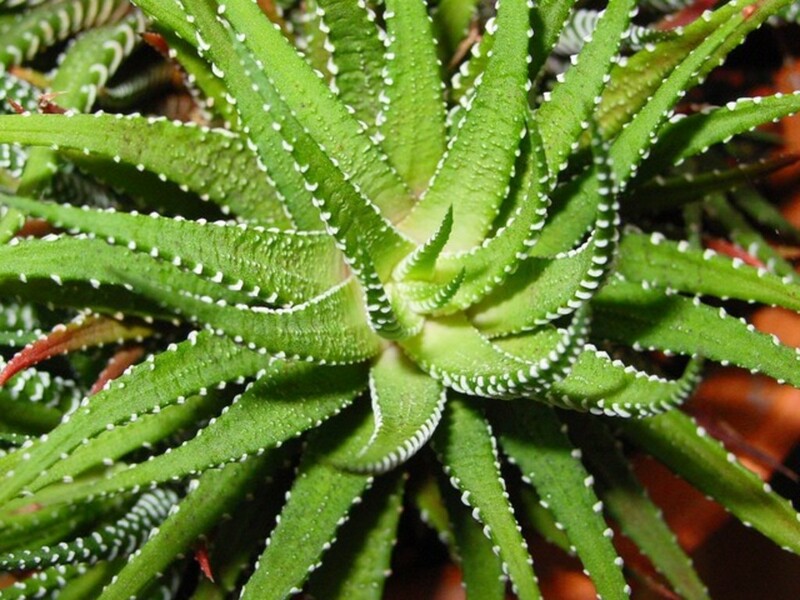 This results in feelings of irritability, of melancholy, suffering from insomnia and more. With the use of a pendulum or dowsing rod, blockages can be discovered, removed and cleared in the Aura, restoring balance and equilibrium. Our positive intentions and connection with Source facilitates the healing and once the blockages are cleared our body is able to naturally regenerate and heal itself. 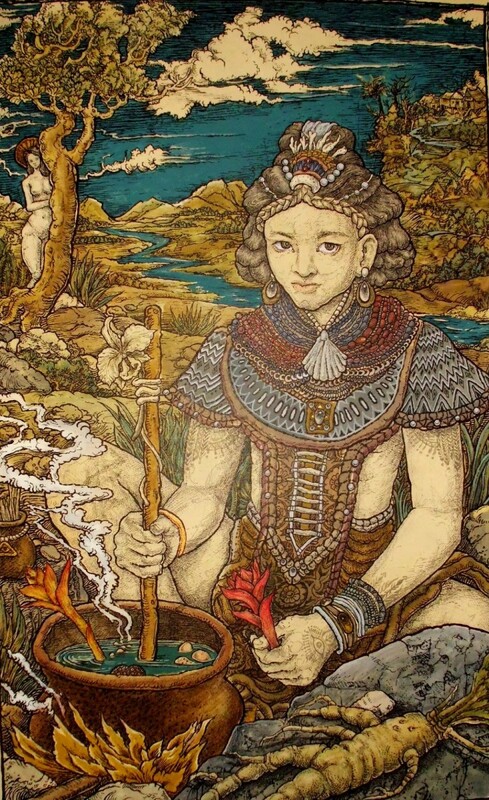 Absent or distant healing energies can be sent to loved ones and friends by way of the pendulum or dowsing rod and our heartfelt well-wishes and prayers. The Universal Energies bring healing to us all. 1. Make or purchase the dowsing tool with which you will be most comfortable. 2. Ask a friend to bury an object (try a metal object or small bottle of water) somewhere in your yard, just a few inches below the surface. Be sure your friend is careful to conceal the burial spot so that it is not at all obvious where they have dug. 3. Before starting, mentally ask your dowsing tool to indicate to you when you are passing over the hidden object. Start walking. You can either take a methodical approach walking in a defined pattern up and down the yard or you can walk randomly, following your instincts. 4. Move slowly. Concentrate on the object and try to remain open and sensitive to the movements of the dowsing tool. 5. When your dowsing tool reacts and indicates a specific spot, stop and see if you have succeeded. If not, try to try again. If at first you don't succeed try a different pendulum, dowsing tool or try a different kind of target. Try dowsing at different times of the day and in different frames of mind as these may all affect the outcome. Keep a record of your attempts and keep at it. You may find that you have a strong ability for dowsing. Thanks for the thumbs up Apostle Jack - much appreciated! Whatever works is a thumbs up for me.Good hub. thanks for your comments regarding your grandpa's abilities. Some people can use just about anything to dowse and be very successful at it, whilst others can try and try and try again and have no results, as you noted. My grandpa used to dowse wells. He could use a copper wire, with a heavy nut on the end, or a piece of steel or wood and they would all work. He could tell me how far to dig and which direction the water was running. He was always right. I tried it and it didn't work for me. I think it involves some type of electro/chemical or magnetic field that aligns with certain peoples' chemistry or electrical energy field created by the nervous system. Some people get a great reaction with anything, like my grandpa, where I didn't have any reaction whatsoever.